Trial by Fire Extremely Annoying! Who's bright idea was this new Trial by Fire content?? So now every time we complete a task we get this new screen telling us how to play the game? Reinforced my decision to spend more time in World Of Warships, they know how to treat their customers!!! Edited by arcticstorm123, 23 March 2019 - 10:27 AM. Well, it just amounts to some free gold and goodies that you get by normally playing the game... Anything free is just fine by me. Edited by arcticstorm123, 23 March 2019 - 12:30 PM. arcticstorm123, you are really offend by small spam with missions for new players? If this will be only for new players and you will not obtain gold from missions, you will be happy? And write "most of us know how to play the game" with 48% winrate is really joke. Not only %, but damege or kills per sortie show that you dont know. At mission 2 or 3 , they say fire at the lead compensating aiming point. Really? Who made the tutorial? Some guys who didnt know there no such thing since 2.0? We should learn the game from some poeple who doesnt even play the game? Edited by Horcan, 23 March 2019 - 11:27 PM. I was under the impresion that we don't have leading points anymore. Edited by Asklepi0s, 28 March 2019 - 03:45 PM. Of course there is.. but is not showing to you anymore like pre 2.0 where to aim, wich is kind of cool for me... I learnt how to shoot in front of the enemy ane how much and by how far. . There is also those types of armament you have.... with cannons that are much faster keep it near the enemy plane while with the MGs they have slower speed so you should aim far ahead of the enemy plane is very nice. . i like that.... also is good for learning to aim especially for new players. For the new asset of the game, i find it very useful for the new player to get accomodated with the game and having rewards as gold in any cases it makes you wanna get into the game even more so a good first impression to the game for the new ones i find it very good. .. Of course in time after some experience new players will find that not all of those LFs are good in dogfight, but hey! that. s why we are here us veterans right? to help them understand... like Discontinued..
You fail to understand our point. That thing described in tutorial was part of the game, before 2.0 . But it was removed. So why in the hell would you put it in a tutorial more than one year after it was removed, unless they dont even play their own game, and things are added by some guy, and removed by some other, without the two knowing what the other guy work is? I understood the point from the begginning, and that is a mistake from them ok, i never paid attention anyway if I would read that part and if there is something that i don. t understand i go somewhere i can find answers, it. s called "community forum"....that little something won. t frustrate me as new player because all is new anyway and i wouldn. t know again... Horcan, let me tell you something, i rode your posts, every posts you maxe, your effort is appreciated and constructive, but when start tipying, your 7 years frustration kicks in and you have a way of saying with such hatred and pesimist and everything but not a single time you wouldn. t say something good about anything in this game.... instead of being consumed by this game why are you bothering anymore if you don. t want to play wowp anymore and just being here to sync your gold with wot or wows. . why are you cmplaining about the game or respond to community and drive us into believing this is the worst game ever made on entire planet if you don. t play anyway....let the players decide if it is bad or good you don. t have to explain how bad the game is, seriously mate. . no offence but everytime when i see a post of you, i don. t know if i laugh or i cry.. you saw that i. m not the first that tells you this kind of stuff. . try to chill and not get so frustrated about some 3 words in a tutorial... if you considered i mocked you ok fine by me, but i wanted to tell you this so to keep that in mind.. your frustrations gonna creep new players, at least let them having a chance at this game. Sorry about offtopic. Edited by BlackLebbel, 24 March 2019 - 03:02 PM. No I'm annoyed by windows popping up gratuitously without any real need. there is no way the latest set of windows for this event is going to turn new players into aces, the information is very basic. I didn't present myself as any kind of uber player, it's just that I'd rather not have this stuff shoved in my face when it's not wanted, like I said it's bad enough when internet sites do this, it's fine for events .where it's actually conveying something useful but this is plain annoying. Not all of us play this game because we are obsessed with win rate, I play what I feel like at the time, looking at people with high win rates they mostly play a restricted set of aircraft over and over again, and your stats display the same pattern, not that there is anything wrong with that, and at least it's not all in I-5's like some people in the top list, but it's not what interests me. That doesn't mean that we should all be subjected to spam, especially when as noted by other people above it's outdated and inaccurate. Edited by arcticstorm123, 24 March 2019 - 05:25 PM. That thing described in tutorial was part of the game, before 2.0 . But it was removed. So why in the hell would you put it in a tutorial more than one year after it was removed, unless they dont even play their own game, and things are added by some guy, and removed by some other, without the two knowing what the other guy work is? Seriously?, this was in the game before 2.0 and they just held a seance?, that makes this worse than I thought! than again at higher altitude any Bf 109 will easily outturn every Yak you throw at it. Actually, at its optimal altitude and above it will outmaneuver almost all aircraft and often needs to be played this way when encountering other fighters in its domain such that BnZ is out of the question. Besides, against heavies which often reside up there evade, turn and shoot down is the way to go. 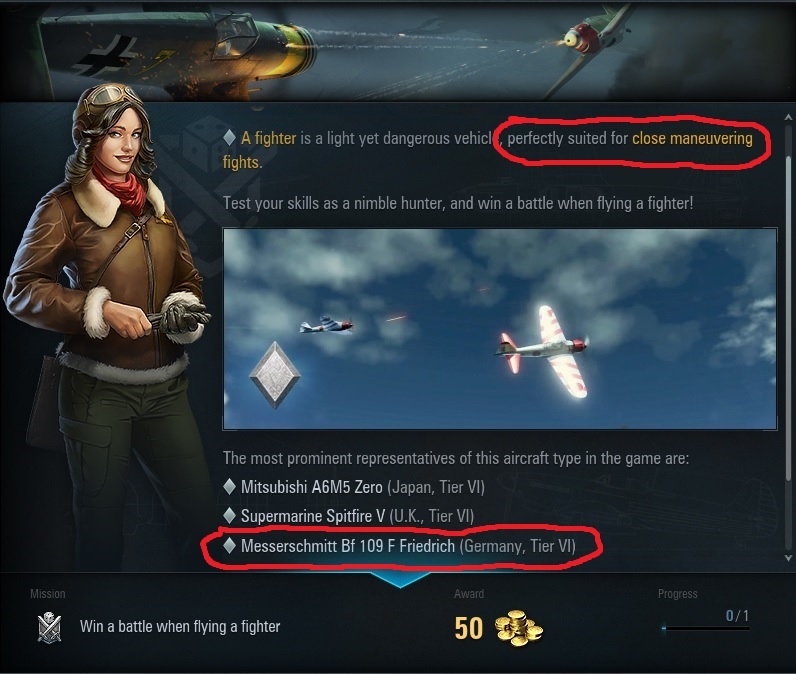 So it's not all wrong, though i don't remember the tutorial making any mention of altitude. yeah, but i see how for new players this might be quite misleading. Edited by Killtech, 24 March 2019 - 09:23 PM. @arcticstorm123: I think you are the only one complaining about these windows. Everybody else is happy about the free gold. Yes, they could have prevented this for players with a number of battles but then we would not have gotten the free gold. Edited by klbergmen, 25 March 2019 - 10:09 AM. Probably a little bit confusing wording over here. The initial message was to fire taking into account that you need to lead (fire with a prediction and stuff). I'll send this case to the team, probably it is worth changing the wording. Dont see why peeps is complainin aboot free stuff? I get the rewards just by flying and doing my thing. There's no specific order, so you just get a popup every now & then that you 'achieved' something and some gold, silver etc ... nice.